The four seasons have never looked so pretty as they do in the NC mountains, especially in the quaint town of Maggie Valley. With a total permanent population of just over 1,150, Maggie Valley bills itself as “Where the Smoky Mountains Meet the Blue Ridge” and, of course, the population swells during peak tourist season. As the story goes, Maggie Valley gets its name from Maggie Mae Setzer. Her father, Jack Setzer, founded the town’s first post office and he named it after his daughter. The Setzer family still has annual reunions in the valley. So, with that little overview, let’s take a look at the 4 seasons of things to do in Maggie Valley. In the spring, Maggie Valley alternates between snow lingering from the winter and new growth in the beautiful, lush valleys. The town offers a variety of great festivals at the Maggie Valley festival grounds throughout the year. Among these are: Thunder in the Smokies Spring Motorcycle Rally (May 4-6, 2018), The Annual Southeastern Mini Truckin’ Nationals, (April 27-29, 2018) and The Icons of Hot Rodding Festival, (May 18-19, 2018). Summer has its own treasures in Maggie Valley. The mountains and valleys are in full bloom with hundreds of flowers, flowering trees and majestic foliage. Some of the special events include: Thunder in the Smokies Motorcycle Rally (June 29-July 1, 2018) and the annual 4th of July Fireworks (July 4th, 2018 – gates open at 6pm). You’ll find that almost every rally and festival are held at the Maggie Valley Festival Grounds on Soco Road. You can see all the festivals and rallies at the event schedule link below. There is always something great happening in Maggie Valley. In the fall, it’s the best time to take a road trip through the Blue Ridge Parkway and visit Great Smoky Mountains National Park. Cherokee Indian Reservation is just about a 30-minute drive from the valley, and they offer casino fun for the whole family, as well as Unto These Hills, an outdoor drama. The fall colors of the leaves make an amazing spectacle of nature that attracts tens of thousands of visitors annually. Take the scenic waterfall road trip, and don’t miss the Soco Falls right here in Maggie Valley. 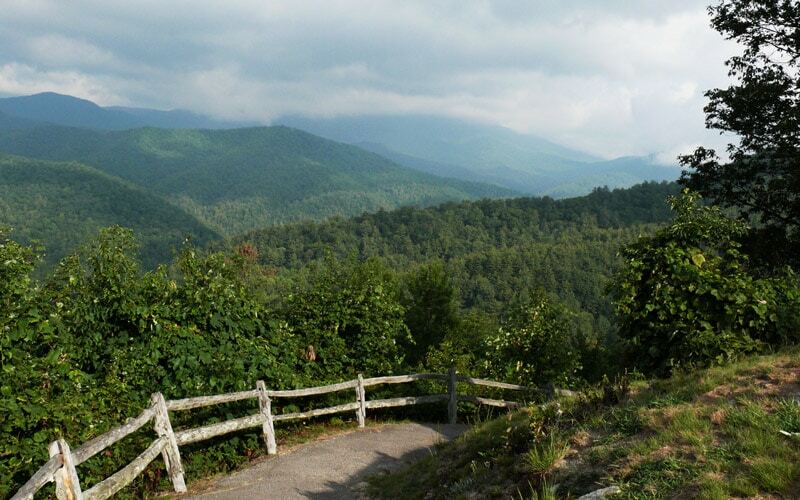 If you want to see spectacular scenery on the Blue Ridge Parkway, stop on the Waterrock Knob Overlook. It offers nearly 360-degree views of several states, magnificent mountain vistas, as well as the Ghost Town in the Sky theme park. In the winter, the main recreational activities of most visitors and quite a few locals are skiing, snowboarding and tubing at Cataloochee Ski Resort and Tube World. Both are just minutes from the festival grounds. If you’re looking for nightly entertainment, some foot-stomping music and dancers, head over to The Stompin’ Ground. It’s billed as the ‘Clogging Capital of the World’. The main street through town is Soco Road and almost everything I’ve mentioned is either on that road, or very near it. Unless you’re planning to go camping, which a lot of people enjoy doing in this scenic natural wonderland, our favorite place is Meadowlark Motel. You can get a cabin or a guest room here, many of which are equipped with hot tubs. There’s a free continental breakfast and free Wi-Fi so you can stay energized and stay in touch with the world. But the prettiest feature by far is the rambling Jonathan Creek that flows along the property line. You can fish, stick your feet in the water, skip stones and, overall, just enjoy the sights and sounds of the creek from their picnic and pavilion area. Can you guess where to find it? You’ve got it – 2878 Soco Road in Maggie Valley. As you can see, there are truly are 4 seasons of things to do in Maggie Valley. But, this is just a light overview. Be sure to follow us in our social networks, join our news letter and visit our events page to see all the events going on in Maggie Valley.